Avail from us superior quality Block Making Machine that minimizes the requirement of wood & steel pallets by laying blocks on the concrete floors. The machine we supply use less cement and can produce any type of blocks. Further, these machines are fabricated from superior quality material that make them highly durable, resistance and more. 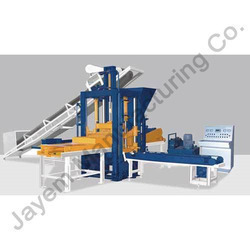 Additionally, these machines requires and plain wooden pallet for each freshly moulded block and require very little space and can be easily moved. Pallet stacker is also available with this model. This Heavy Duty Hydraulic press has been designed specially for fly-ash bricks, With the pressure as high as 200 tonne, it can produce over 3000 bricks per hour. The casting of bricks is not done on pallets, but, directly on a rubber belt which conveys the brick to be hand picked and stacked on the manual hydraulic pallet truck, therefore the hassle of pallets is eliminated. It is a P.L.C. Controlled machine making it easier to use and efficient for high production. 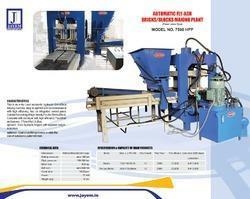 This Automatic Hydraulic Press for Fly Ash Bricks has total weight of 750 kgs. along with Roller Pan Mixer, Conveyor belt and Manual Hydraulic Carts. The number of bricks can be as high as 14-16 pcs. per stroke of standard size without frog mark. The Hydraulics and P.L.C. used in this equipment are of very high qulaity and standard. This has the capacity to take pressure as high as 200 tonne. 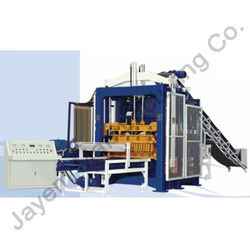 At Jayem Manufacturing, we offer a comprehensive range of high quality machinery for building materials for various construction requirements. Made of quality raw material and using modern manufacturing techniques, our brick making machines pass through stringent quality control checks to ensure strict adherence to industry standards and parameters. 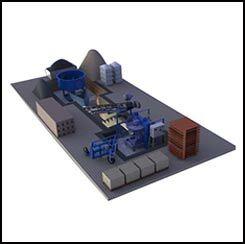 Available at most reasonable prices, our brick making plants like fly ash brick making plant, tile press, etc. are known for their high performance, efficiency, ease of use and durability. Has produced the most versatile plants tor the manufacture of Fly-ash bricks/ pavers/ tiles/ blocks made out of fly ash as the main constituent in combination with sand, lime and gypsum. Bricks can also be produced out of fly-ash and cement mix or sand lime or sand cement i.e. The same machinery can be employed for making concrete Bricks/Soil bricks. The process consists of mixing and grinding the materials in the pan mixer. With the addition of batching equipment, the material can be mixed with, in the required proportions by weight, to have uniform quality most economically. The mixed and ground materials are conveyed on the belt conveyor to the brick making machine from where the hydraulically compressed bricks are continuously produced and taken to the curing site on pallets by the pallet trucks/conveyors, where, bricks are cured by water spray or steam cured for early strength. The main machines of the system are PAN MIXER, BELT CONVEYOR, BRICK MACHINE, PALLET TRUCKS along with the wooden pallets. Pan mixer is specially designed for thorough mixing of the fly ash ingredients with the grinding of the lime, gypsum and other coarse and granular materials in the powder form. Power is transmitted from the electric motor to the pan mixer through the heavy duty worm reduction gear box provided below the pan mixer. Hard wearing liner plates are bolted and can be changed when required. Heavy cast iron rollers revolving on bearings with metal seals, are provided to grind the material to the desired shape and size. Changeable Mixing and discharge blades are of special alloy steel with hard faced tips. The pan mixer has a capacity of 500 Kgs. per batch and powered by 15 H.P.,3 electric motor. Belt conveyor is made of sturdy steel frame. Power is transmitted from the 3 H.P electric motor to the reduction box and to the conveyor roller. The fly ash mix can be regulated according to the speed of the brick making machine. Conveyor belt is made of Nylon belting with rubber top. Friction less idlers are provided with seals on both sides to prevent any ingress of Fly-ash and dust, etc. going in side the bearings to the idlers. A collecting Hopper is provided below the discharge gate of the pan mixer in order to collect and stock the mixed material from the pan mixer and discharge the required quantity on to the belt conveyor. It is bolted on the belt conveyor's frame. JJ 1500 BMM is hydraulically operated, automatic, PLC controlled, self diagnosing type, having digital display. Computer connection can be fitted if required. The machine develops approx. 35 tonnes of hydraulic force on the bricks for the required time to make the bricks uniform. The machine is robustly constructed, steel structured, heavy duty, designed for taking up all types of heavy loads, due to variations in raw materials. Various types and sizes of moulds can be fitted with a maximum size 250 by 250 by 100 mm. Different types of monograms, frogs can be made on the bricks. The machine gives a very high production. The output is adjustable maybe from 10,000-12000 bricks per j hr. Shift or more, at a very economical cost. For continuous running of the machine, The hydraulic oil cooling arrangement is provided on the machine. The machine is powered by 15 H.P., three phase electric motor and is fitted with Hydraulic pump, Hydraulic motor, Hydraulic cylinders Direction control valves, etc. The table rotation is hydraulic, 3 stationed PLC controlled with manual and auto operations. Specially designed to handle the bricks with pallets for effortless and easy transportation of fly ash bricks with reduced labour. Provided with 3 nos. pneumatic tyre wheels. Hydraulic hand operated arrangement for lifting or lowering the pallets. Consists of weighing arrangement with dial/digital display. Radial scraper or storage hoppa weigh bin with pneumatic operated gates for fly-ash and sand loading, hydraulic / electrical rotation. Water batching system with feeding pump with Digital Display. Screw conveyors with hopper for lime and gypsum.